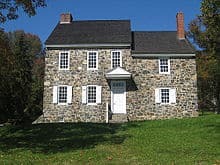 The first fieldstone farmhouse on the site may have been built in 1725 by Burger Mynderse. 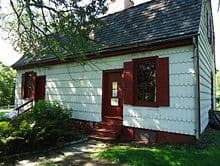 The property was sold to Elsie Hasbrouck, and she in turn gave it to her son, Jonathan, who married Catherine (Tryntje) Dubois and they built the existing structure on the original foundation, if any, in 1750. The house was surrounded by a large stock farm. The home underwent two significant enlargements before it was completed in 1770. The home has an original “Dutch Jambless” fireplace. A temporary kitchen was built by the army upon their arrival in 1782. Changes were made inside the house including the addition of an “English” style fireplace in the General’s bedroom. Existing buildings such as stables and barns were also enlarged and improved on the site. Most Army buildings were removed by the Quartermaster-General’s Office at the end of the war, with the exception of a “Ho:(use) in the garden”, which was given to Mrs. Hasbrouck. It no longer exists. 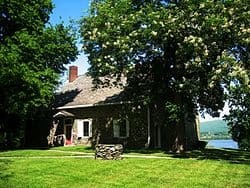 In 1850, it was acquired by the State of New York and became the first publicly operated historic site in the country. Today, it is a museum furnished to recreate its condition during the Revolutionary War. It covers an area of about seven acres (2.8 ha), with three buildings: Hasbrouck House, a museum (built in 1910), a monument named the “Tower of Victory”, which was completed in 1890 after four years of construction in order to commemorate the centennial of Washington’s stay, and a maintenance shed/garage built in the Colonial Revival style in 1942. 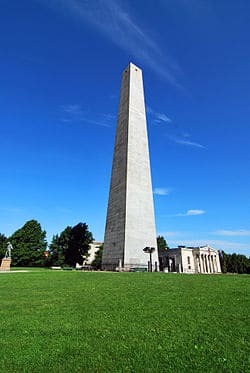 There is a statue entitled “The Minuteman”, by Henry Hudson Kitson, that was erected on the grounds on November 11, 1924. The site was declared a National Historic Landmark in 1961. It is also one of the more than 2,000 contributing properties to the East End Historic District, the most of any district in the state. The Washington’s Headquarters State Historic Site is located on Liberty Street in downtown Newburgh. It is several blocks from the Hudson River and enjoys a commanding view of it and Beacon Mountain beyond. Although owned by New York’s Office of Parks, Recreation and Historic Preservation, the site, like all other NYSOPRHP properties on the west side of the mid-Hudson region, is operated by the Palisades Interstate Park Commission.